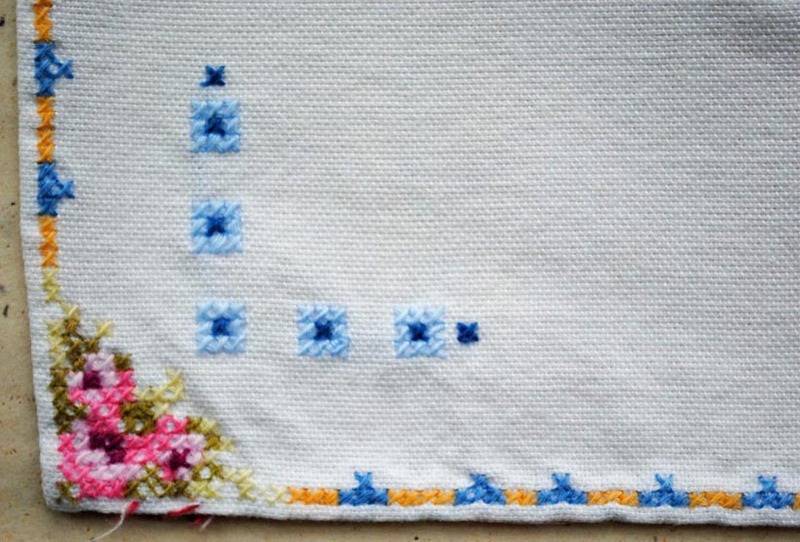 A few months ago, I posted a story about my grandmother Oma’s needlework (you can find it here). 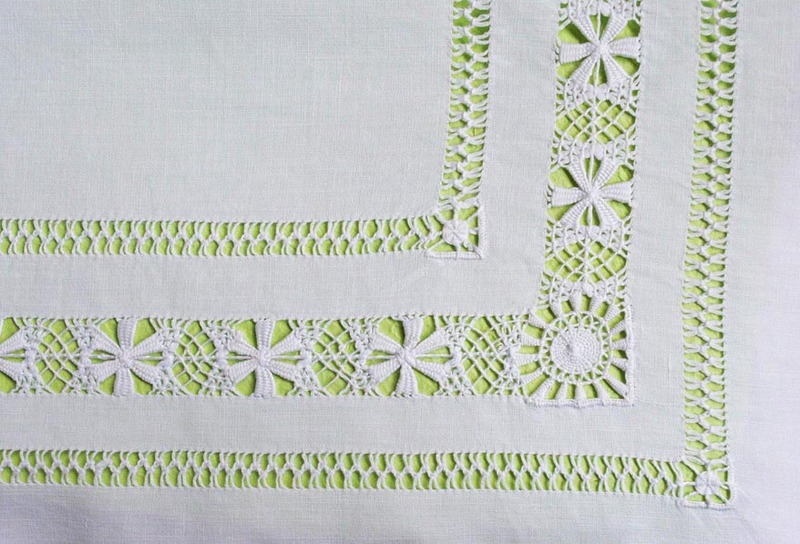 My mother then decided to give me almost all of Oma’s embroidery, except for the tablecloths we still use for Christmas dinner. 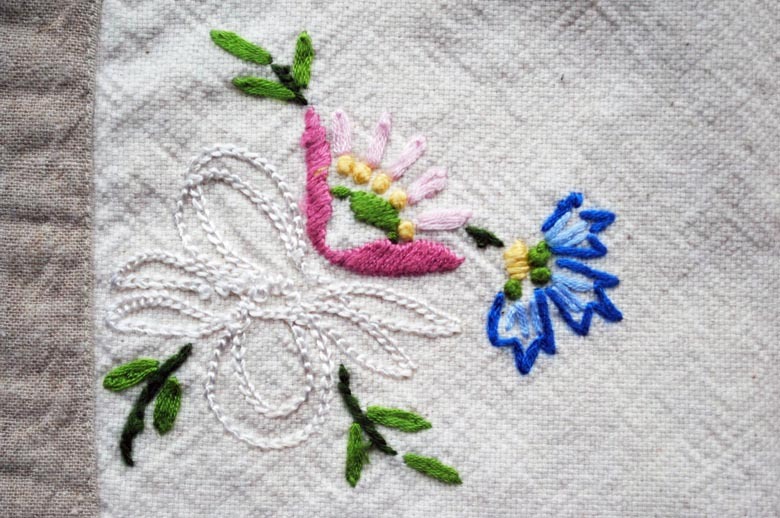 I don’t know anything about embroidery so I can’t discuss the techniques, but I find the work so beautiful that I decided to post photos. 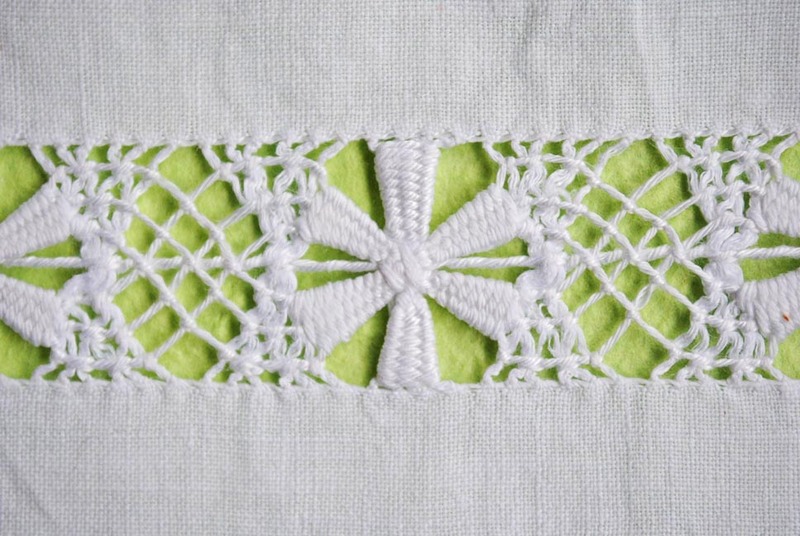 Some are embroidered tablecloths or runners, a few are place mats, and one is a pillow case. If anyone would like to shed light on the techniques, I’m all ears. 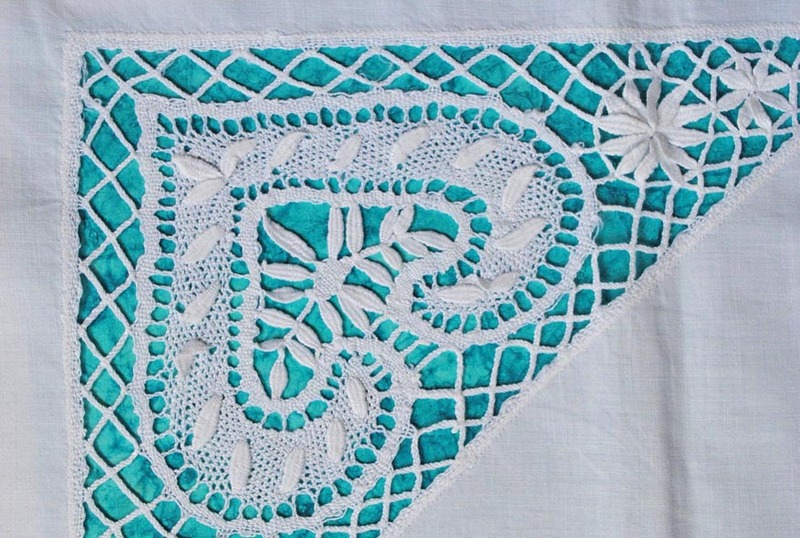 The history of embroidery isn’t at all what you’d expect. 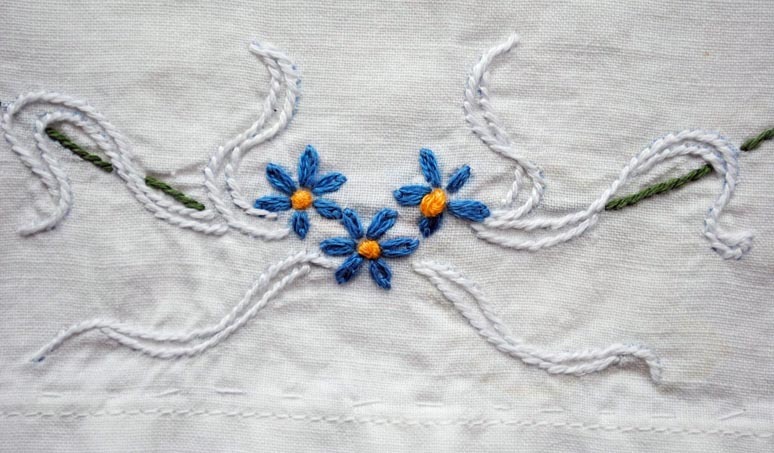 Once upon a time, in about 3,000 BC, embroidery was a man’s task. In ancient cultures around the world, it was taught to talented boys, who studied under masters in 10-year apprenticeships. 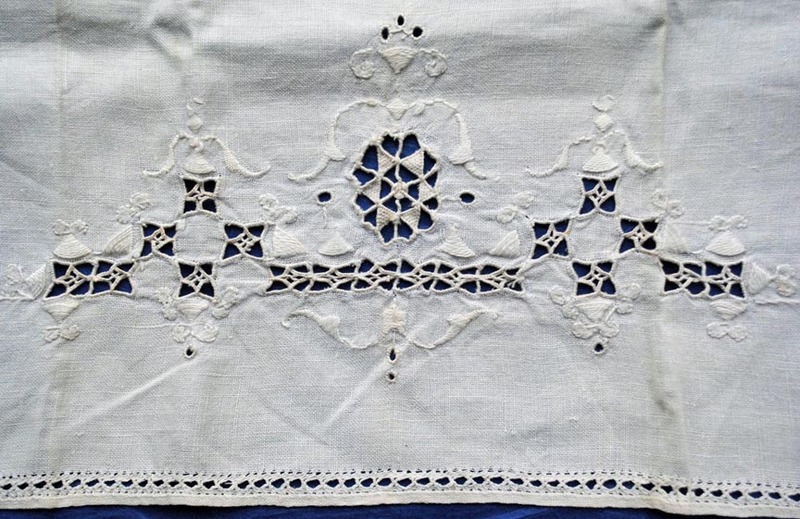 It’s possibly one of the first forms of art, evolving in every part of the world where people practiced sewing, every region developing its own specific styles which were passed on through generations. 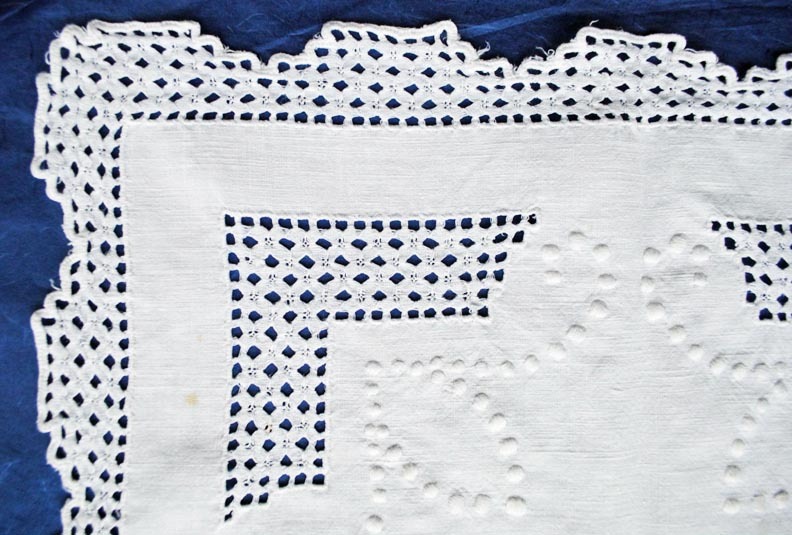 This, of course, is how my grandmother learned the art, as part of her domestic education at school. At that time, her abilities had real value. They were an important part of being considered a desirable wife (she married in 1930), just one of the many domestic skills required to run a successful household at that time. 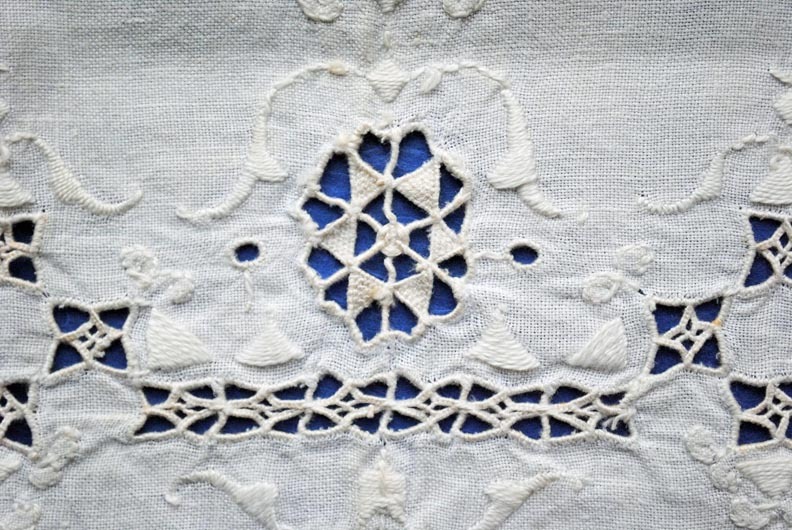 In the 20th century, as industry advanced, allowing needlework and other household tasks to become mechanized, society changed, and along with it, the expectations that society had of women and that women had of themselves. 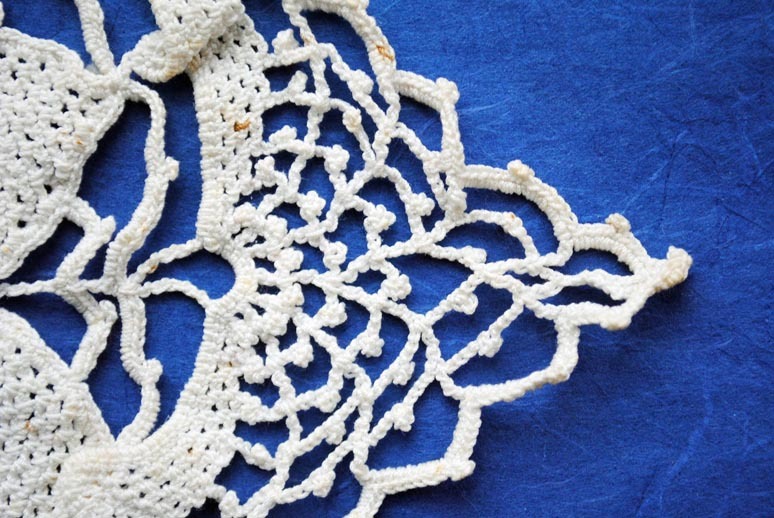 The value of handmade needlework began to dimish. 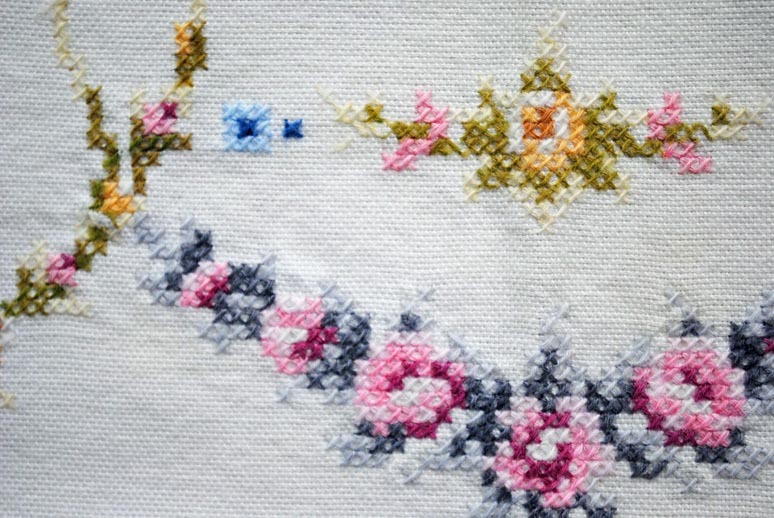 Today, the ability to do needlework has lost its value, and computers have taken over the task. 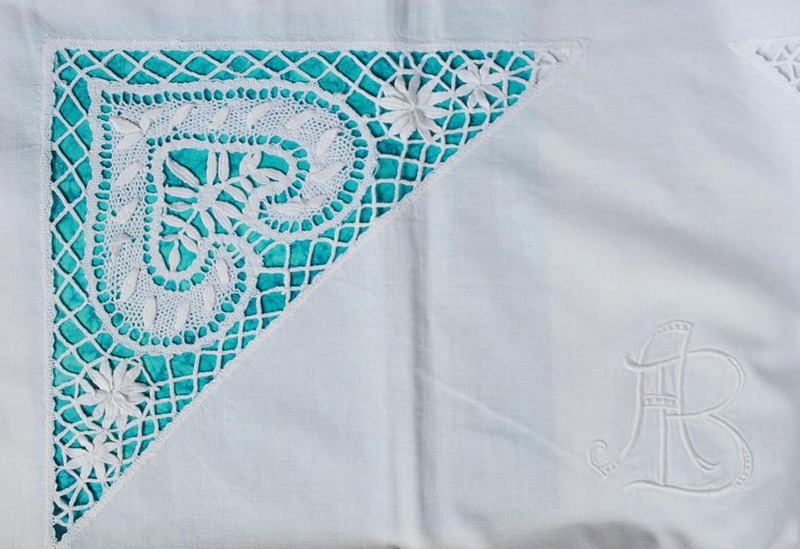 Hand embroidery is considered a craft or hobby, two words that belittle the beauty and delicacy of this lost art, and downplay the extraordinary skill and patience required to create works composed of such minute detail. 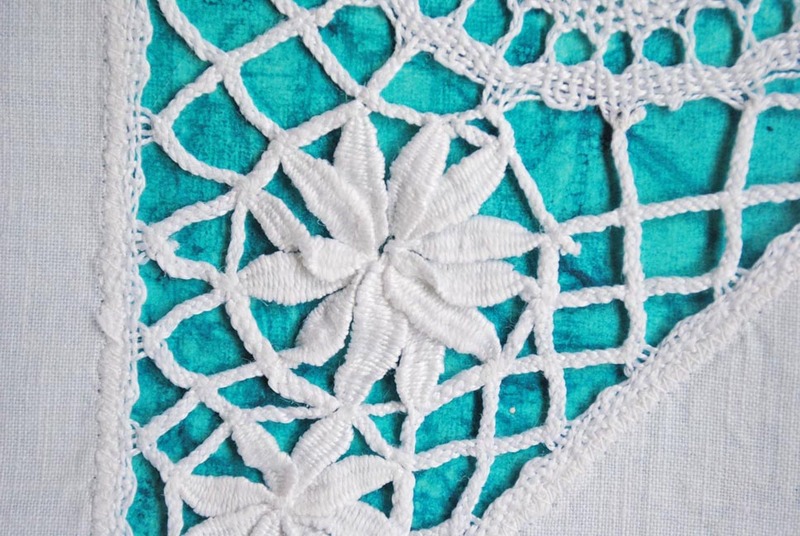 Needlework has executed a functional backflip, from a basic, essential skill for women of all classes to a practice enjoyed by those who have the luxury of time. 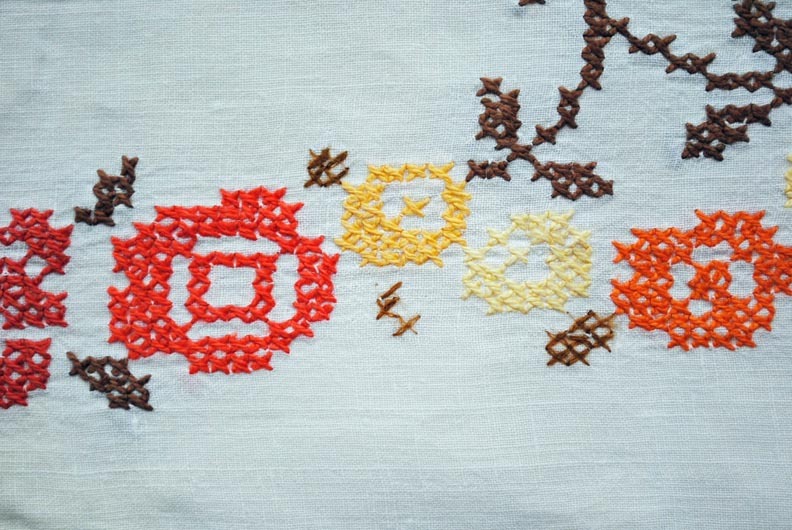 But of course everything evolves, and although needlework is no longer a part of everyday life for most of us, embroidery continues down new and intriguing paths. 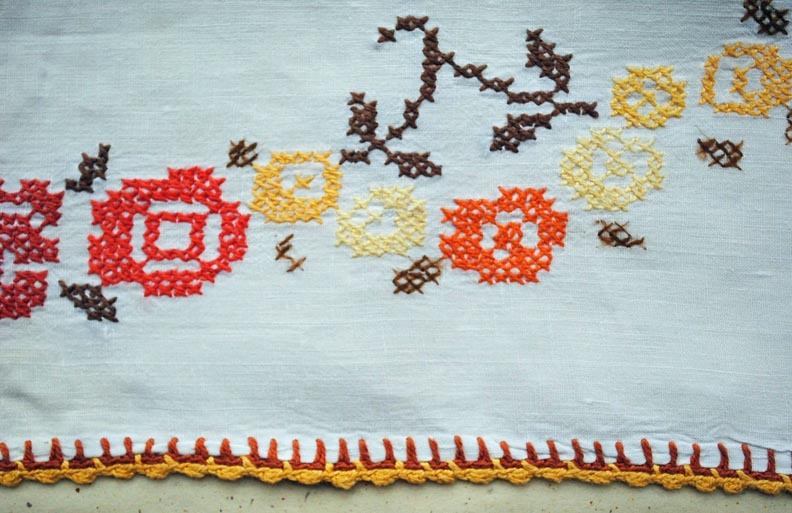 The art of embroidery has been appropriated by fine artists, who employ both hand stitched and computer generated techniques in their work. 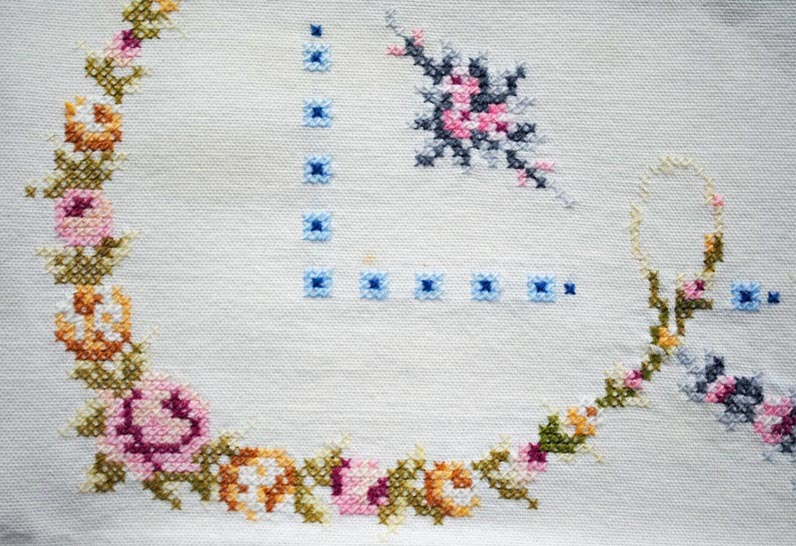 Richard Saja, who embroiders scenes onto toile fabric. 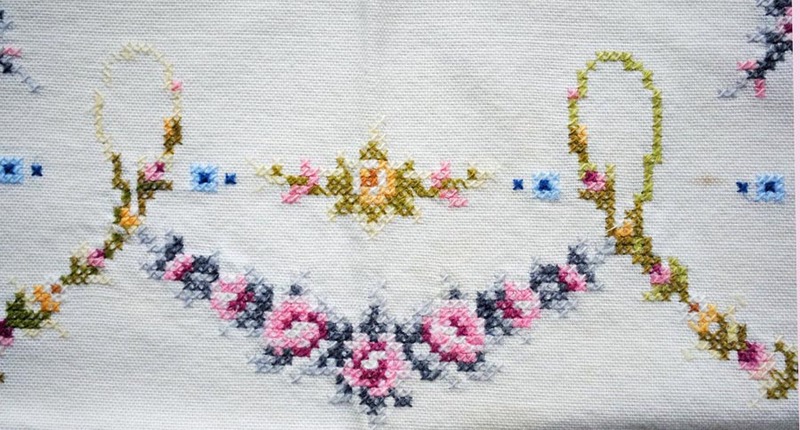 Cindy Steiler, who creates embroideries framed in vintage and antiqued hoops. 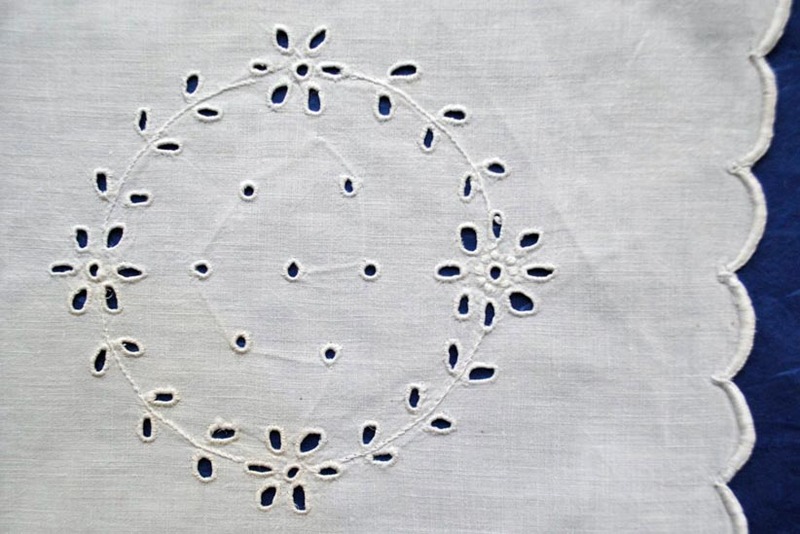 Jenny Hart, who draws with needle and thread. 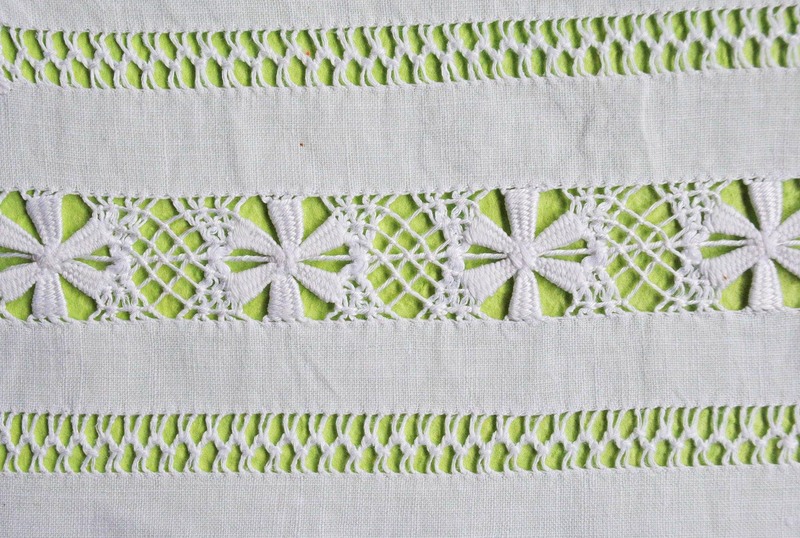 I’ll finish with my all-time favorite tablecloth from Oma’s stash. No matter how much I look at her work, it always knocks my socks off. The yellow blossoms are each about 2 inches/5cm wide. 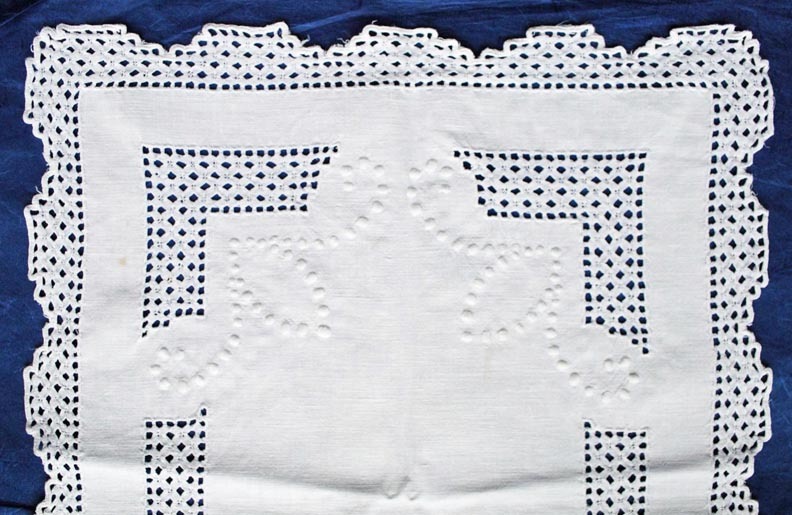 The immaculate, evenly spaced little stitches are almost invisible. 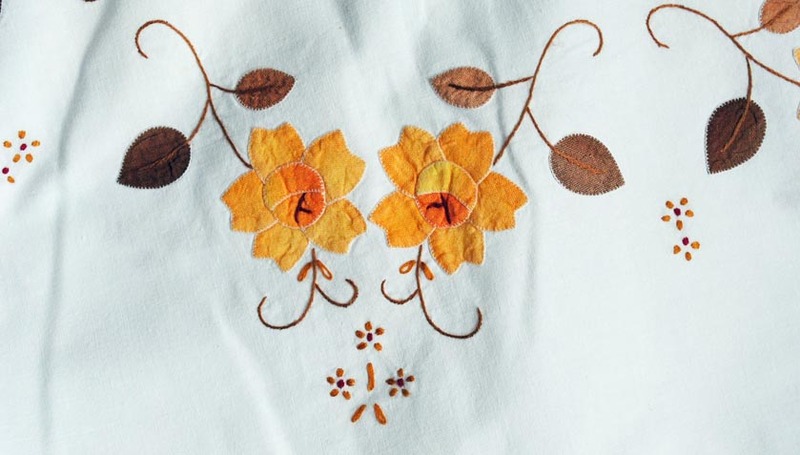 My mother was cleaning out an old trunk recently and gave me three sets of pillowcases embroidered by my grandmother, Oma. 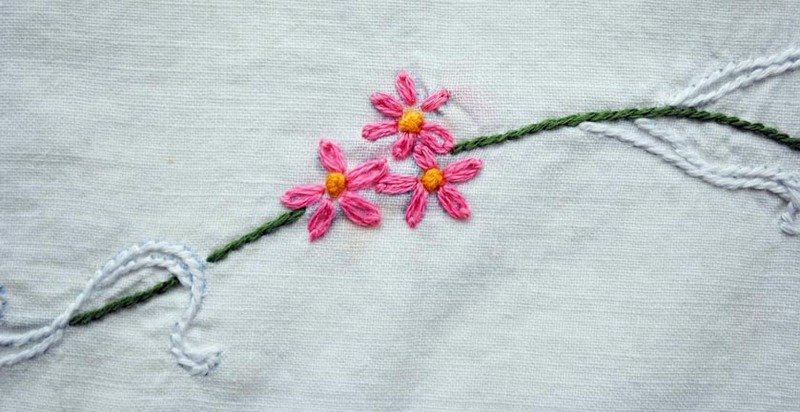 I had never seen embroidery like this before, and it made me think of a time when handcrafting was taught to everyone as a necessary skill and that creating everyday things by hand was once common. As I examined the pillowcases, it became obvious that they displayed a progression of her skills. 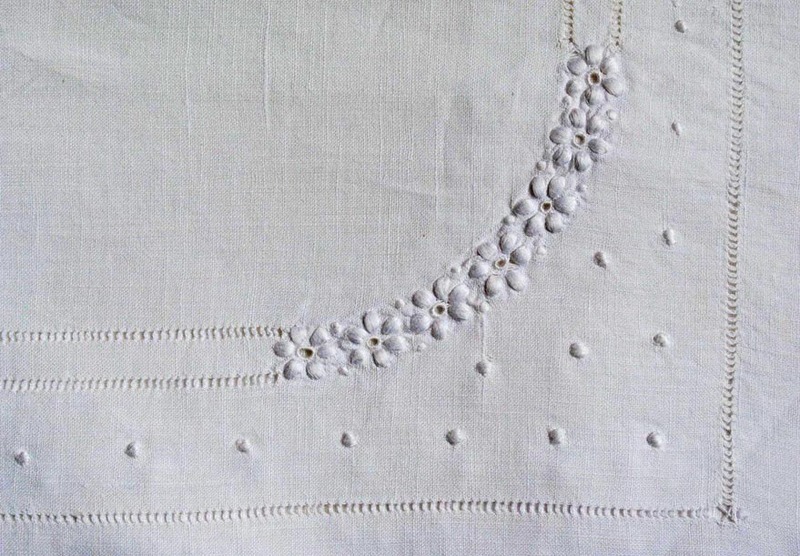 This type of work is called white on white embroidery and is a traditional folk embroidery found in many countries. 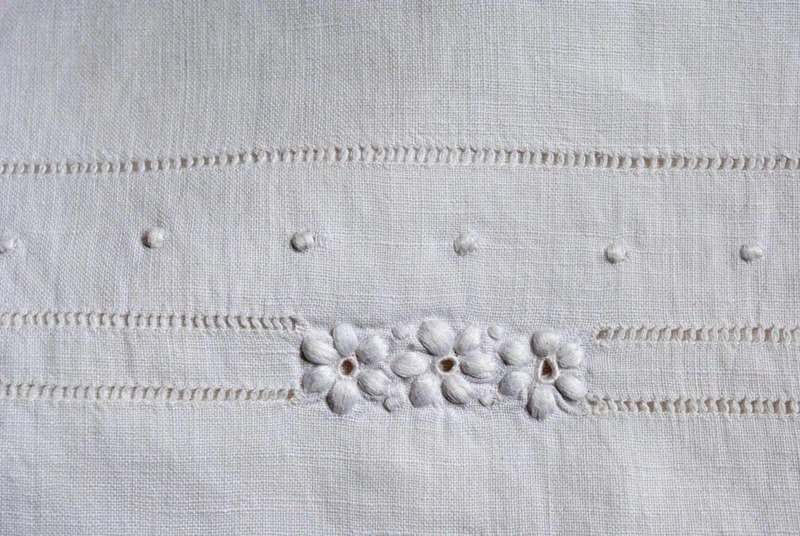 The first set of pillowcases, above, has plump little flowers and dots with a delicate open border, which my mom tells me is created by teasing the threads of the white linen fabric apart, then rebinding them with white thread. 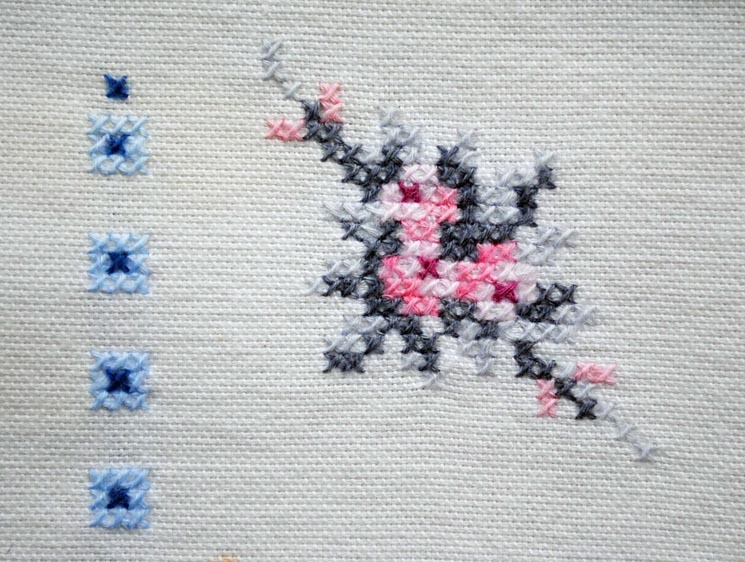 The flowers and raised dots are formed with tightly clustered threads. I imagine that there’s a tiny piece of fabric or balled up thread inside to provide such lift, but that’s just a guess. 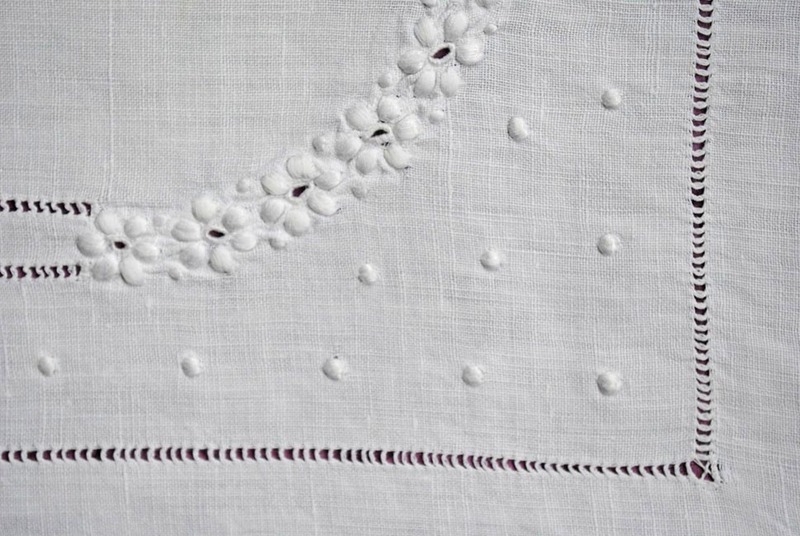 Below, I’ve inserted a piece of dark paper into the pillowcase to better see the stitches. The three flowers below are about 2 inches/5 cm wide. 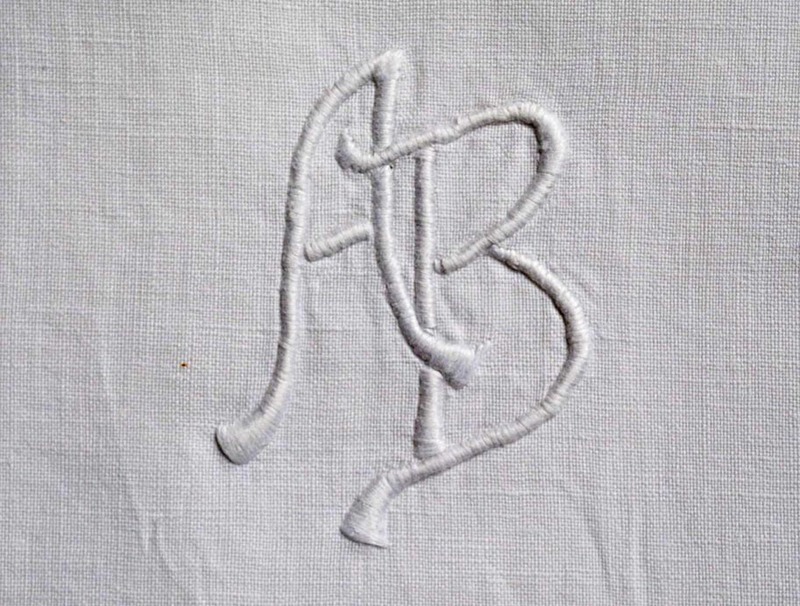 Here’s the simple monogram, 2.25 inches/6 cm tall. The second set of pillowcases is a whole new kettle of fish. Suddenly, there’s a leap in skill. 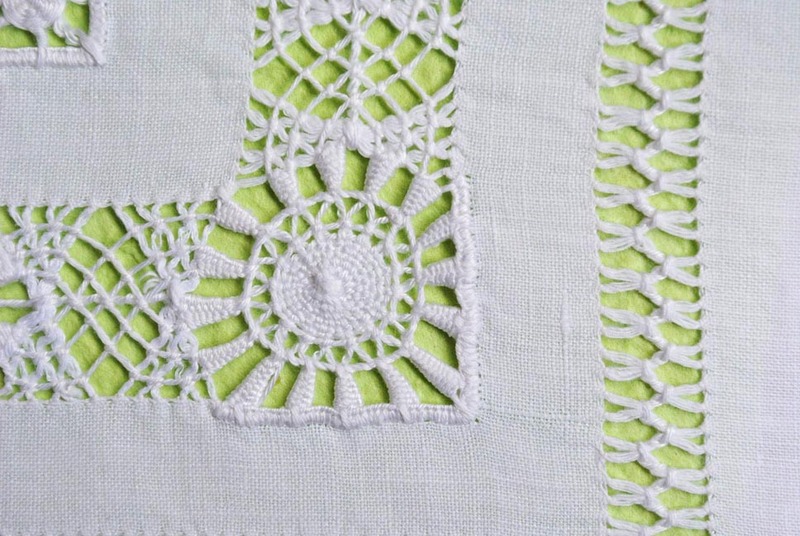 The borders on these pillows have opened up, loose, confident and playful, but at the same time absolutely precise. 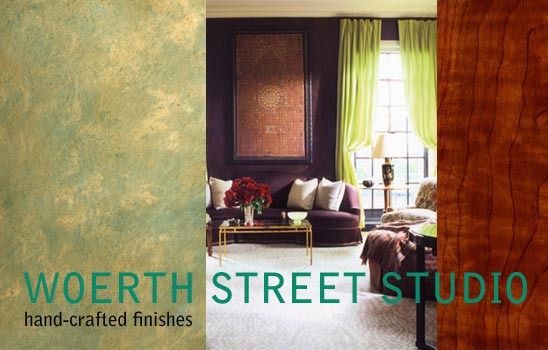 The second photo below has a green sheet of paper inserted. 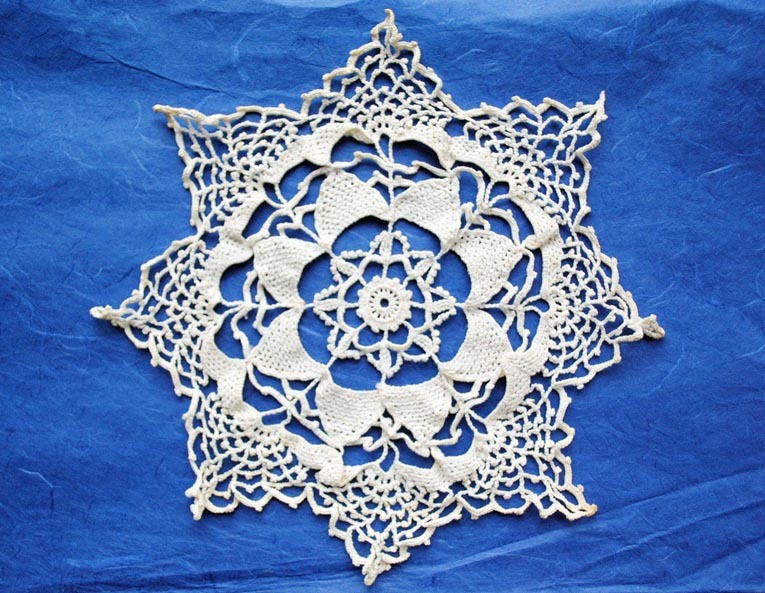 The square sunburst motif below is about 1.25 inches/3 cm across. Look at those tiny little stitches! 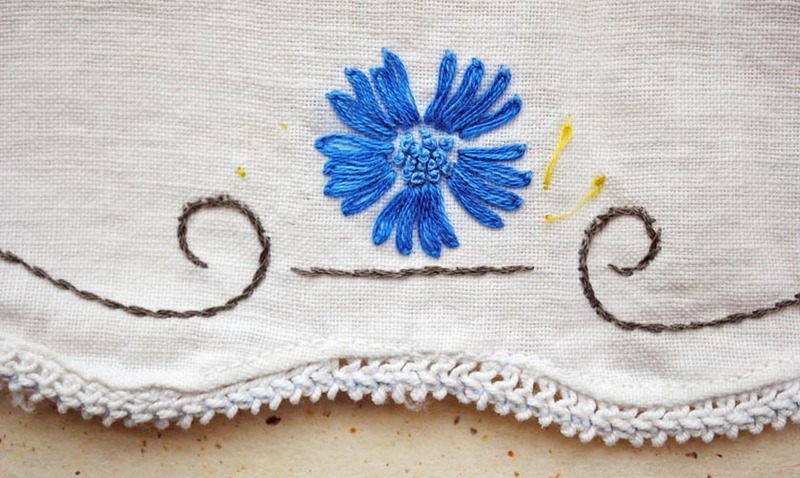 I know nothing about embroidery, but clearly the detail is painstaking. 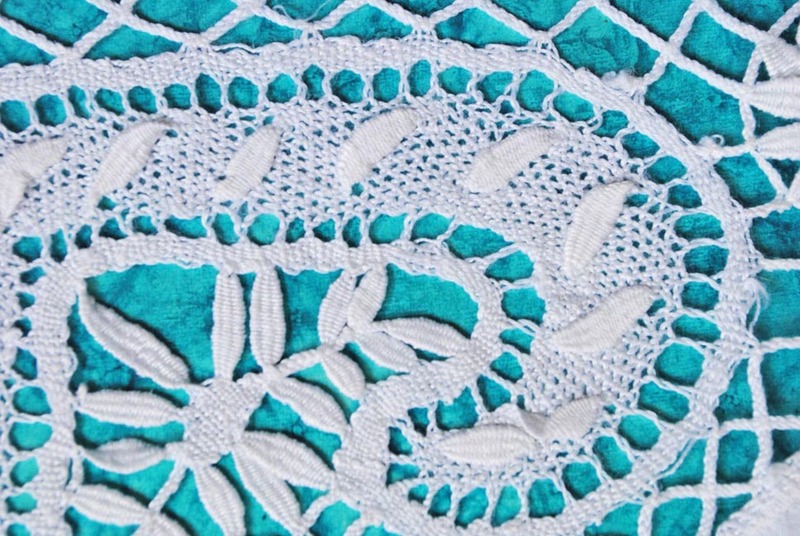 Here’s a close up of the borders; width from top border to bottom one is 3 inches/7.5cm. At first I thought these stars must be machine made and sewn in. They seem impossibly small and perfect, less than 1 inch/2.5 cm tall. 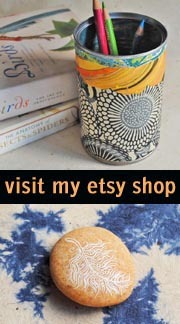 But everything else is impossibly small and perfect, too, so I’ll trust they’re handmade. 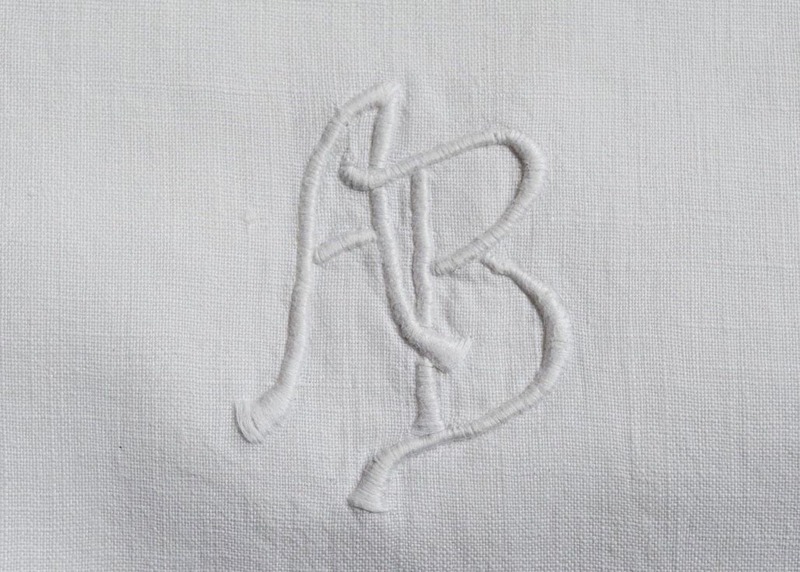 The monogram is similar to the preceding one, but a touch more graceful. Finally, the pinnacle: a full-on virtuoso performance! 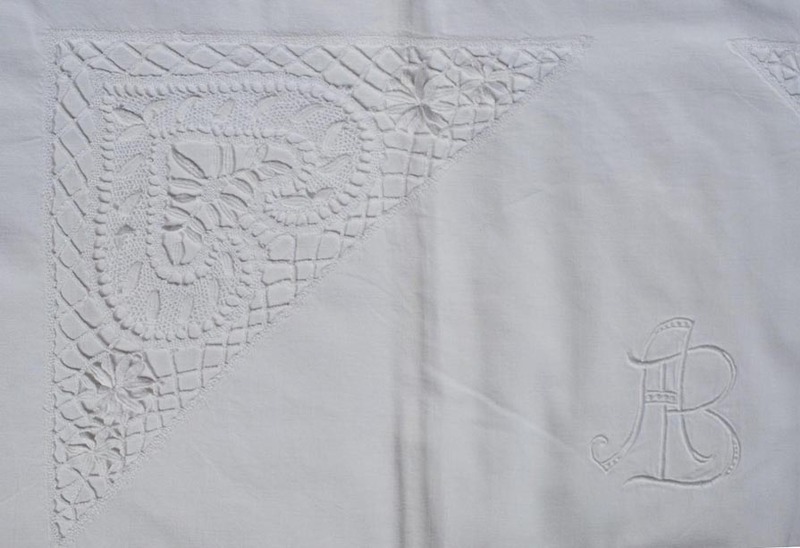 Each pillowcase in the third set has two 10-inch/25 cm wide triangular motifs, one in each upper corner, displaying a traditional heart design. Yes, hard to see. Paper inserted inside pillow case again. The level of detail is excruciating. 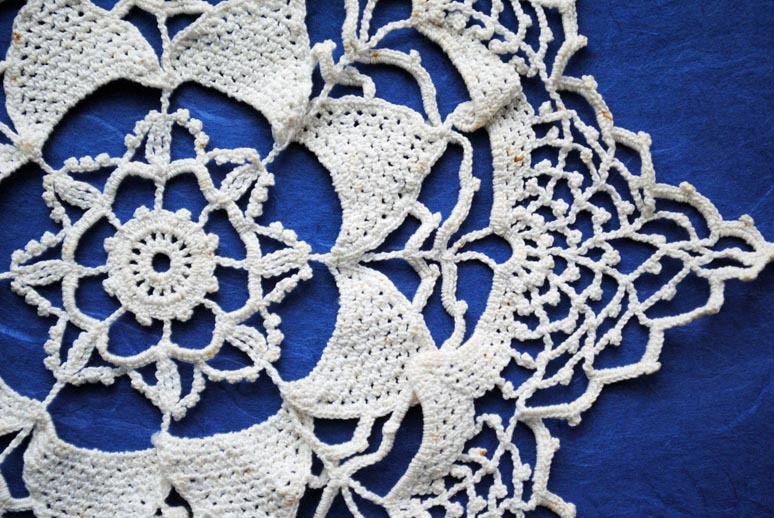 I can’t imagine how long it takes to create a pattern like this. 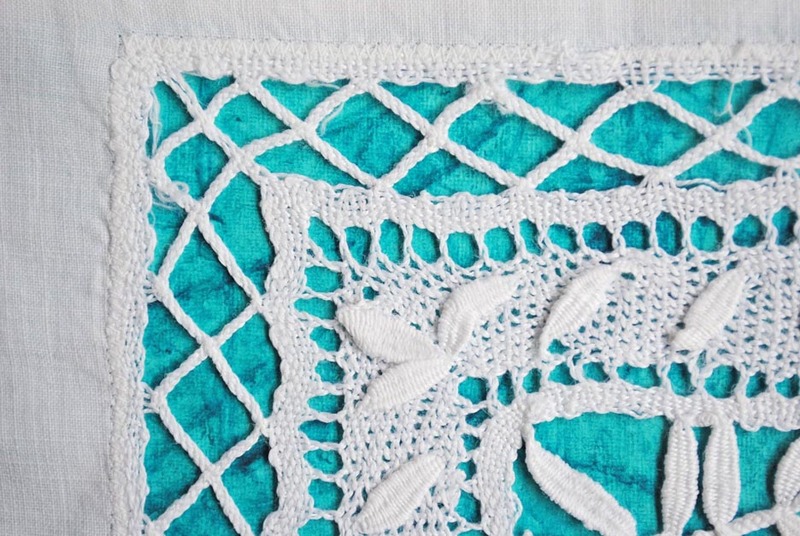 Look at the different types of stitches and the patterns they produce. 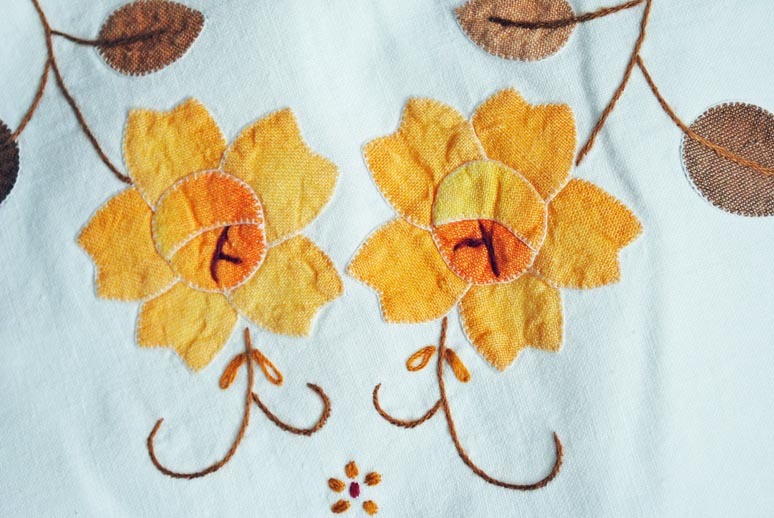 Notice how in the flower detail below, each petal has been separately created, then layered to create a cluster. The circle around the flower measure 1.5 inches/4 cm across. 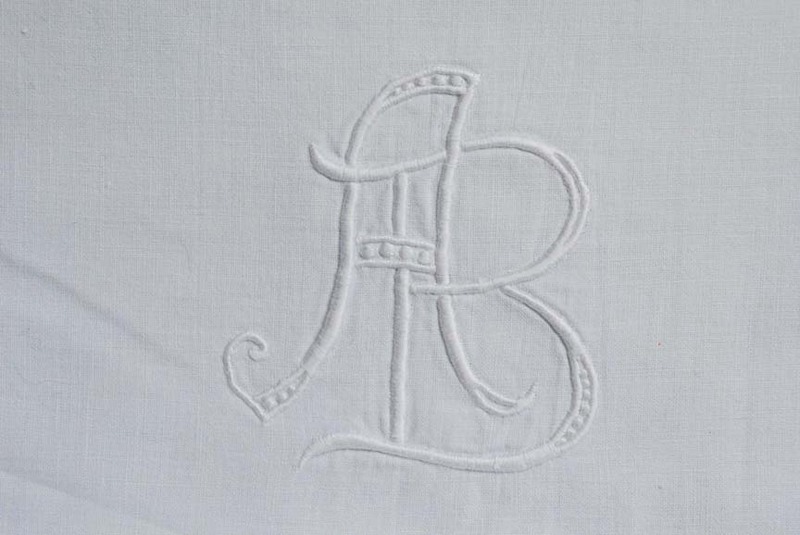 Look how much the monogram on this set of pillowcases has changed from the previous sets: graceful, elegant, balanced. And bigger! It’s 3.5 inches/9 cm tall. Even the buttons are meticulous. Oma was born in Germany in 1910. 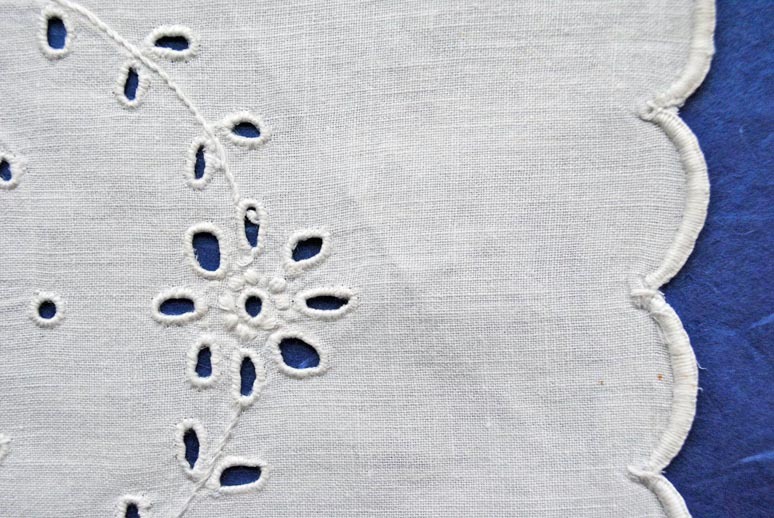 She probably created the first set of pillowcases as a child, and embroidered throughout her teenage years. 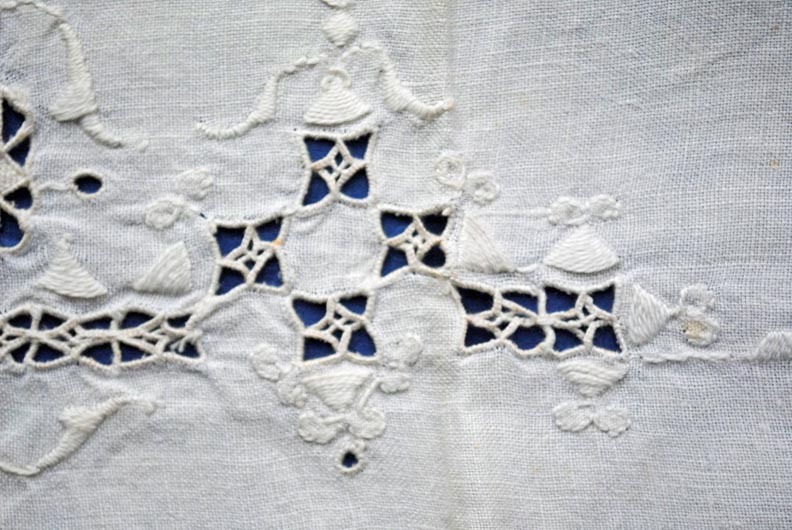 The monogram represents her maiden name, so this work was completed before she married at 19 and was probably part of her bridal trousseau. 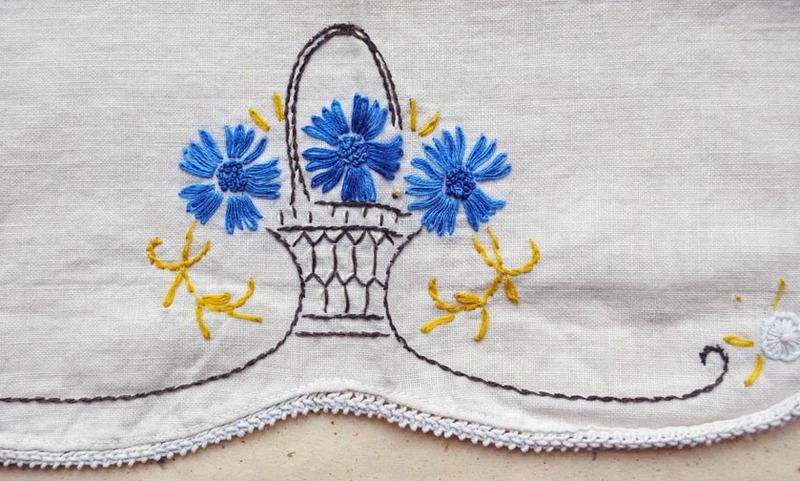 My mother remembers taking Handicraft Class in school, also in Germany, between the ages of 9 and 11, where she learned embroidery and knitting. In my Home Economics class in high school in Canada, we learned baking and general sewing. 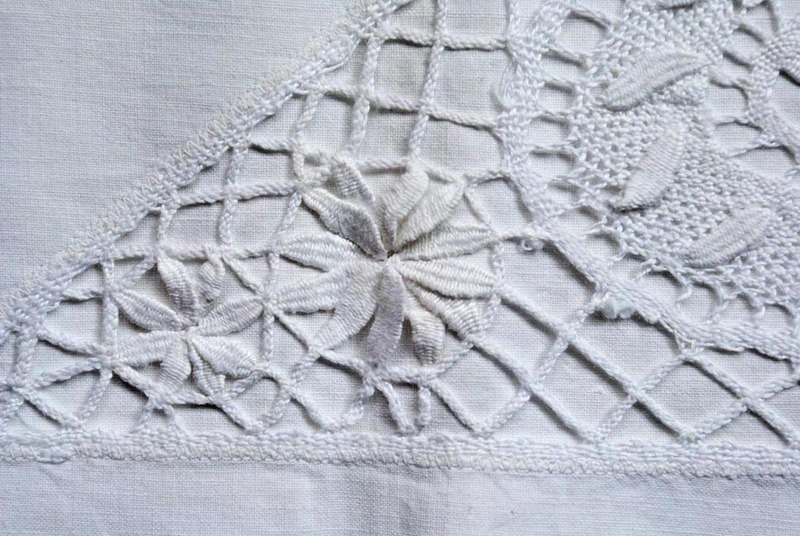 I love the precise learning required to develop the skills of my grandmother, and although I realize few women would like to return to a time when hand-embroidering linens was expected, the magic of it is bewitching. 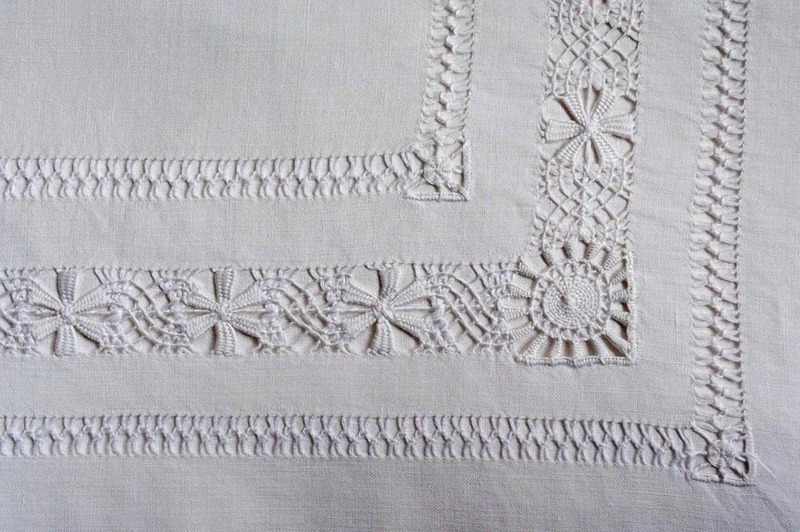 I wonder if Oma enjoyed embroidering, or if it was a dreaded chore. 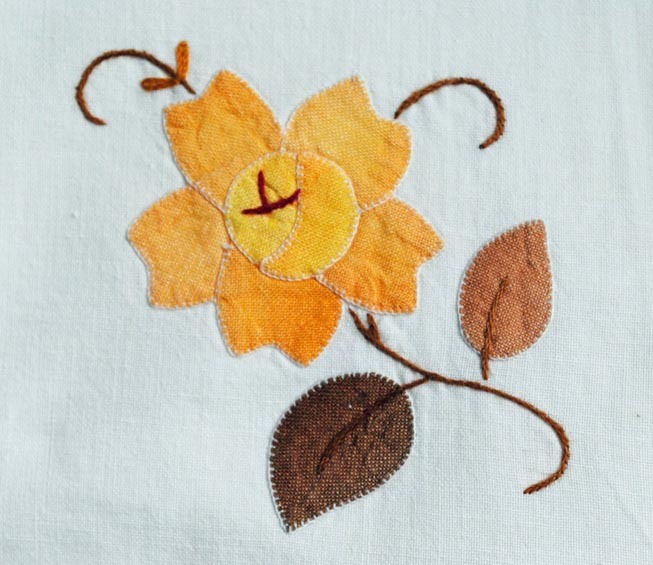 Did she relax as she stitched, or was she hunched over in frustration? 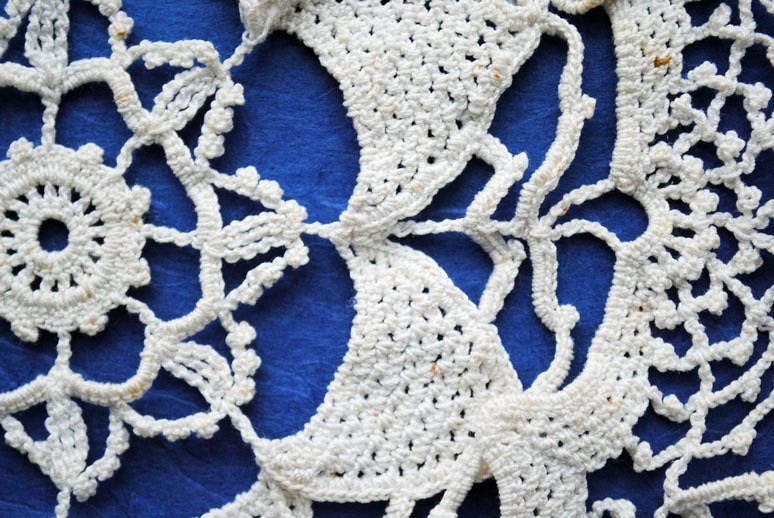 The patterns are so skillfully rendered that I hope she found it fun to pick up her needle and lose herself in the patterns.